Times Passion Trails, an initiative of the Times of India group organizes trips which are based on various niche interest areas. 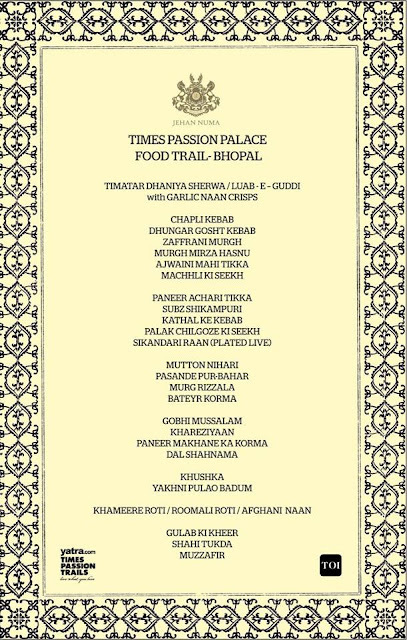 So when their latest food trail covering palaces and royal cuisine had Bhopal as one of the venues I was extremely interested. Soon I assembled with twenty other experience seekers at the Jehan Numa Palace, a heritage hotel run by the Royal family, to proceed on this culinary journey. Jehan Numa Palace, built in 1890 was named after Sultan Jehan Begum who ruled Bhopal in the 17th century. The venue for the Royal Feast which was curated by the Nawabi family themselves was one of the large banquet halls of the palace. 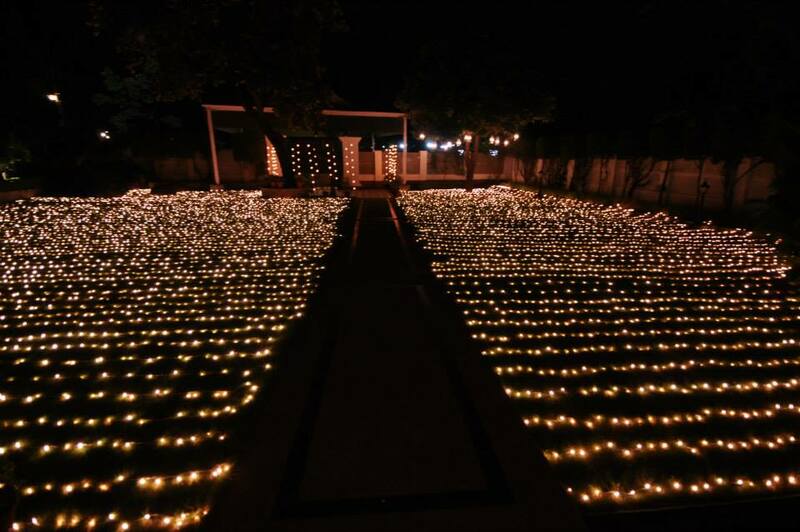 The lawn at the entrance was lit up beautifully like a thousand Taare Zameen Par. Over drinks and starters I had a brief chat with Mr Sikandar Malik, a very knowledgeable and enthusiastic historian who is also known for his Heritage Walks in the city. 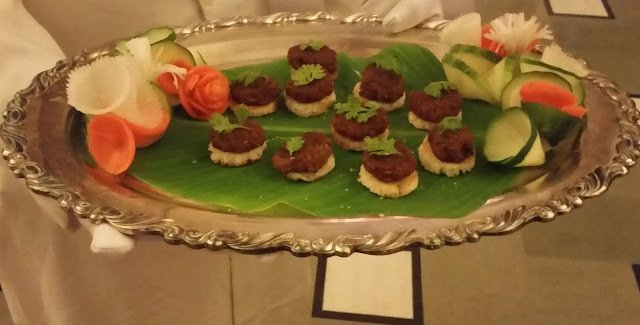 We were having some delightful Galawati kababs and Liver Canopies as finger food for the drinks, and I asked Mr Sikander how the Bhopali cuisine are different from that of Lucknow and Hyderabad. He told us that Bhopal was the second most important princely state after Hyderabad in India. The Bhopali cuisine has influences of Afghan food, as the royal family came originally from Afghanistan. 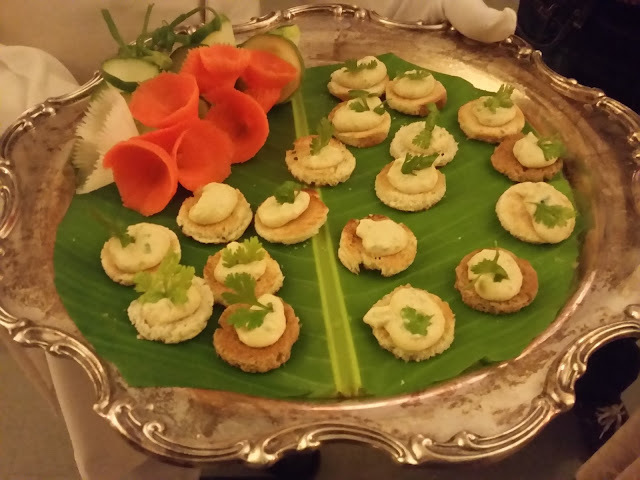 The Awadhi influence is due to the initiative of Nawab Shahjehan Begum who had brought over chefs from Lucknow. The stress in the culinary style is on flavor of the ingredients used in the food, as well as its easy digestion. Since the area is a green belt with lots of vegetable being cultivated, a unique feature of the cuisine is use a lot of veggies in kababs especially kachumber. The Afghani influence on the cuisine has also led to use of many herbs in their food. Mr. Sikander Malik also gave us some other useful insights. Like dastarkhaan, Bhopal had a concept of Basthali where the whole basti sits on the same cloth and has their meals. 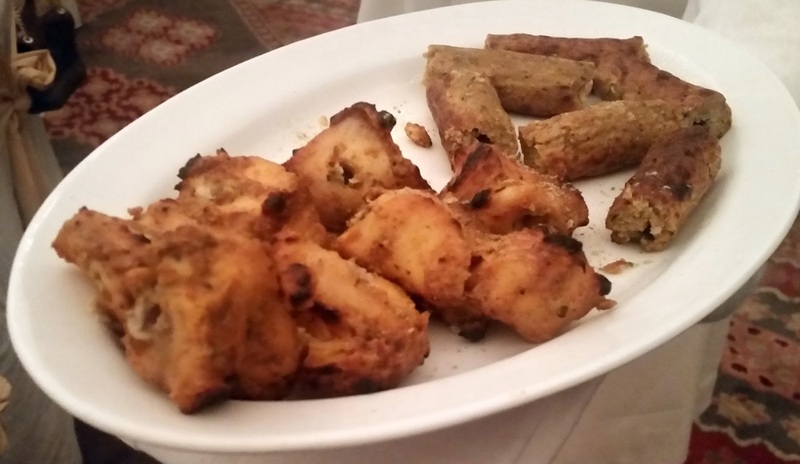 It is said that the origin of Galawati Kababs could be traced to the royal kitchens of Bhopal. Haji Murad Ali, the famous Tunday Kababi, was a rakabdar from Bhopal who impressed the Lucknow nawabs with his version of his famed dish and later moved to Lucknow. The galawatis here were mounted on flat rusks. I was told that the rusk biscuits of Bhopal are indeed special and the galawati uses about twenty different spices. 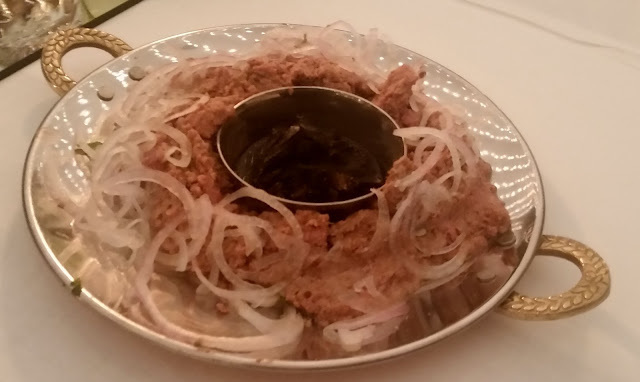 Qalias are the other specialties of the Bhopal cuisine. After the first session with drinks and finger food we were now seated at the huge banquet table in the hall. I happened to sit next to Mr Jamal Ayub, the Times of India columnist from Bhopal, who also filled me in with tidbits about Bhopali culture and cuisine. The starters were quite unique. Chapli Kabab (which is a dish of Peshawri origin) had minced meat mixed with finely chopped onions and vegetables and were soft and succulent. Bhopal is known as the City of Lakes and has numerous water bodies – leading to availability of good quality fresh fish. The Machhli Ki Seekh and Ajwaini Fish Tikka were proof enough of these. I was especially impressed with the mild seekh kabab which was soft yet firm. In all the starters the things to be noted was the stress on the combination of flavors, rather than richness. Then came a strange twist to the dawaat. 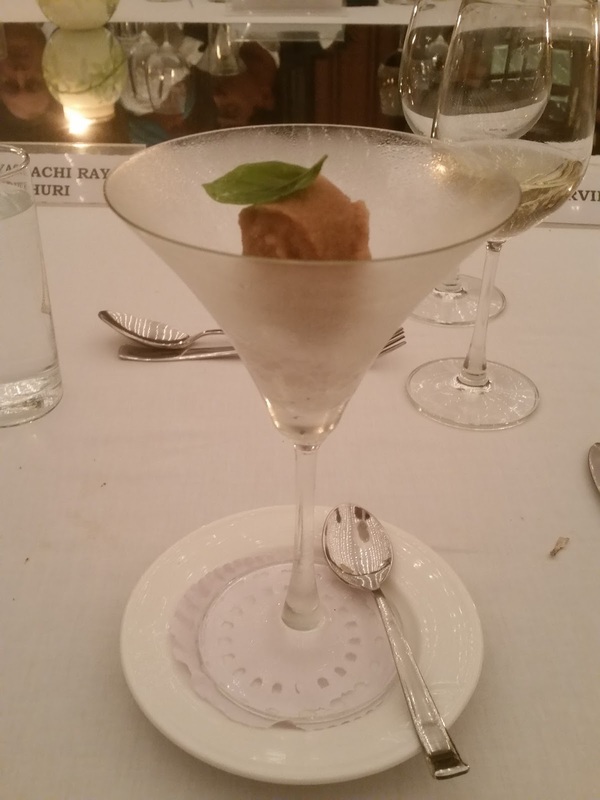 We were served Paan Sorbet in crushed ice in the middle of the meal, possibly as a palate cleanser. The dish was prepared using authentic flavours of the famed Bhopali Paan. Bhopal had some amount of French influence, and I believe French Bourbon descendants are still living in Bhopal. 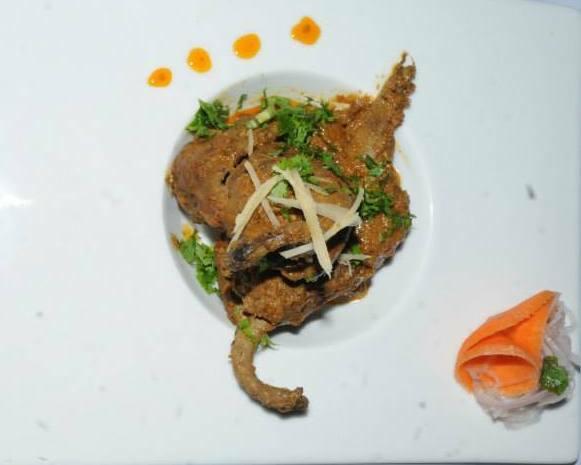 The Sikandari Raan was next, a recipe dedicated to Nawab Sikander Begum who ruled Bhopal in early nineteenth century. 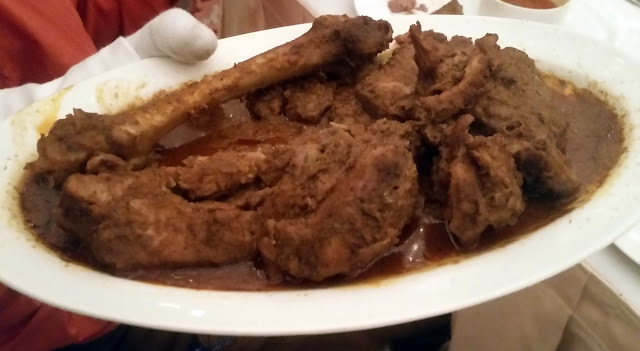 As the raan (mutton leg) was already cut into pieces, it did not offer the usual visual delight. However the meat had taken in the marinade well, and tasted brilliant. The Bhopali version of Nihari to me tasted close to the Delhi one, albeit with a lower dose of spices. Pasande Pur Bahar was a recipe which has been harnessed for years. Meat is pounded, mixed and marinated with spices for some time and then cooked. It had a smokey aroma and was served covered in onion slices around a pot of charcoal. I loved the Bateyr (Quail) Korma which went well with the Afghani Naans. The Bhopali biryani is actually a pulav, where they add layers of rice after preparing a meat broth. We were served Yakhni Pulav Badam which had succulent mutton pieces on a bed of fragrant rice. The rice had soaked in the yakhni or meat stock and tasted delicious. As opposed to its Hyderabadi counterpart, it is light and low on masala, and the focus again is on the flavour. 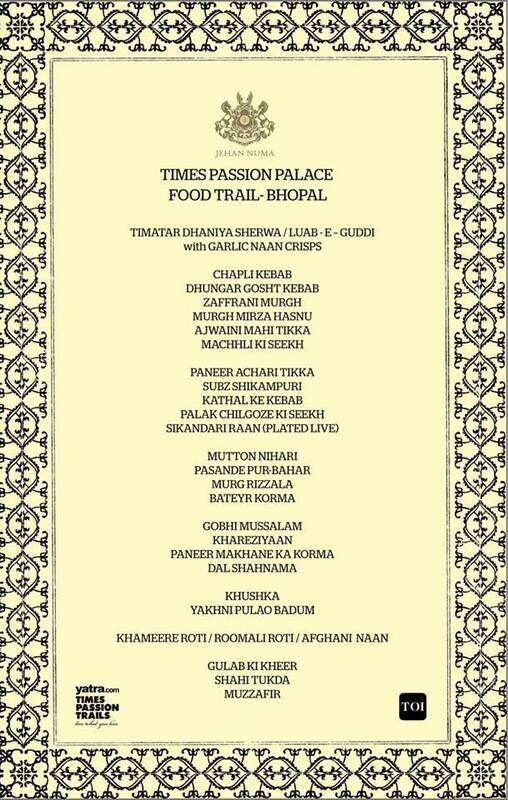 Bhopal Nawabi cuisine has a lot of choices in vegetarian food as many of the ministers were Hindu. Kathal or Jackfruit Kabab was a delicacy which I had not tried earlier. The paneer dishes included Paneer Achari Tikka and Paneer Makhane Ki Korma. Khareziyan was a potato based dish cooked with jeera. We were told by Mr Sikander that Kharezi could be prepared as a dry of shorba item. It is best enjoyed with Khuska the rice from Bhopal and some dal. Among the desserts the highlight was Gulab Ke Kheer, a kheer prepared from rose petals. We were told that no sugar was added to the dish, which had adequate sweetness and a rich flavor of rose. This was indeed the highlight of the desserts. Muzzafir was a sweet prepared from semiyan. Shahi Tukda, the dish we are so familiar to here in Hyderabad, was not really special. 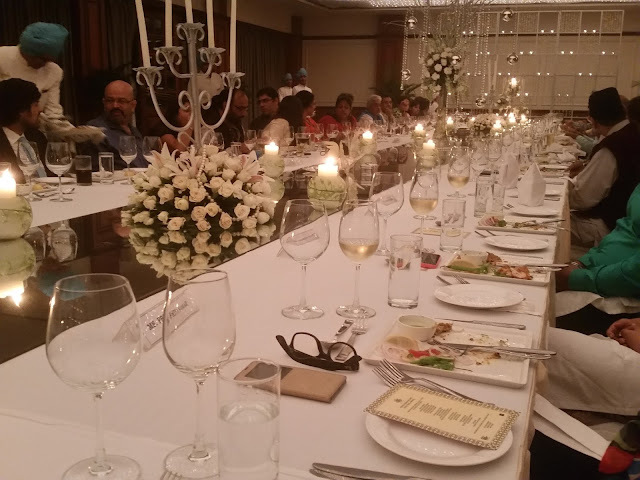 The setting, hospitality, and quality of food made the dinner an unforgettable evening. Apart from that one got some very interesting insights on the culture and food of the Bhopal royals. Our hosts, the members of the Royal Family had taken personal interest in organizing the dinner, and their gracious hospitality during the sit down dinner made it even more memorable. Dada you are a food star. What an impressive elaboration of the experience. When you are in Delhi / Noida, let's do a rating session together. Wow! Reading this blog makes me hungry. Thanks for sharing your culture and food.